Actually, there is nothing particularly patriotic about this cheesecake, except for the fact that it makes me want to stand up and salute it whenever I take a bite. 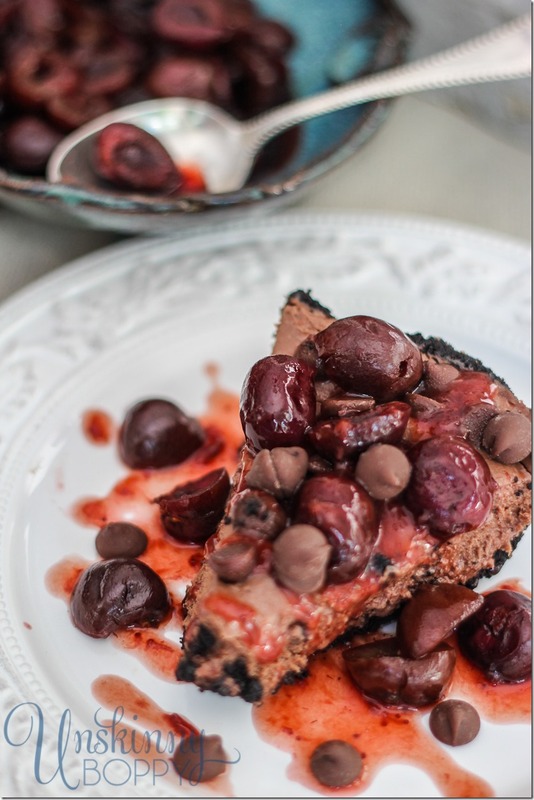 This is a great recipe to throw together in the summer when cherries are in season and you want to impress your family members with your mad fresh cherry recipe making skills. Not a mushy maraschinos in sight! 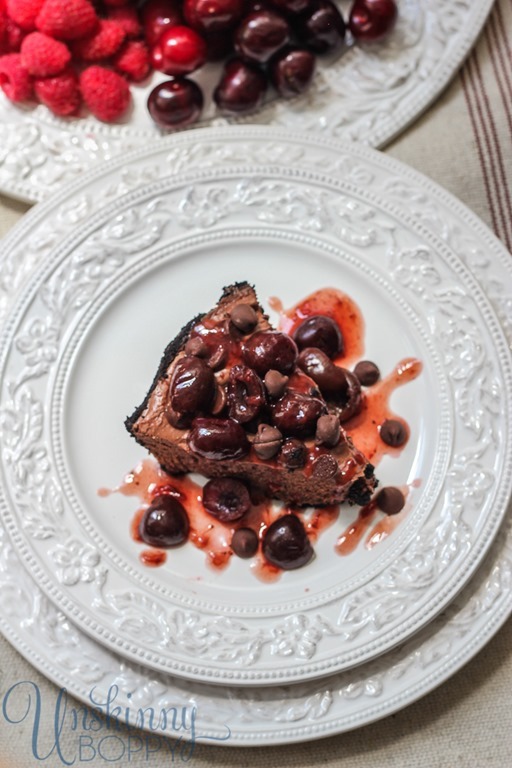 I found this recipe after Garrett wanted to taste the fresh cherries in Publix one day and I wound up buying a whole pound of them. Then I got home and was all, “Well what do I do with them now?” After quizzing my facebook page I started searching Pinterest for cherry recipes and came across this beautiful recipe for creamy chocolate cherry bars. I decided to try it out but used a storebought pie crust instead of making square bars. To tell you just how delicious this chocolate cherry cheesecake recipe really is, let me say I have made TWO of these desserts in the past two weeks to take to family dinners and this is the only piece I could save to take a photo of because all of the other pieces were devoured. I don’t even have a photo of the whole pie, just this one lonely leftover slice. Just to be safe I photographed it from all angles. You know how I just said on my facebook page last week that ain’t nobody got time to be a food photographer? Well, ok. I lied. Apparently I do have SOME time for it. But only for really great food. Not all that rainbow of artificially colored junk. Since the Fourth of July is coming up fast, I really wanted to incorporate some red, white and blue into this shot to make the cheesecake recipe more patriotic, so I put the leftover cherry topping in a blue bowl. 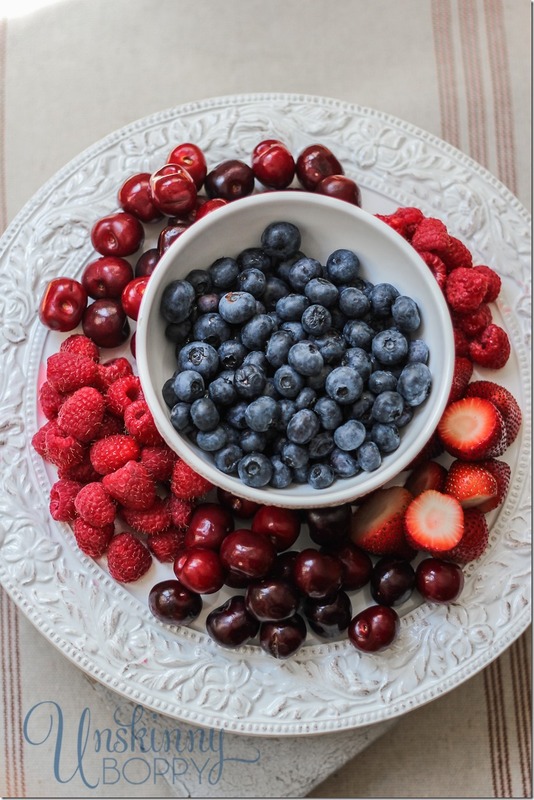 Then I considered the blueberries sitting in my fridge to add to the patrioticness of the shot, but I realized that might throw some folks off because blueberries are nowhere to be found in the recipe so I made a pretty fruit tray instead. How great would this be for an Independence Day throw together potluck? Add a fruit dip and you’d be the hit of the party! Just be sure to pit your cherries better than I did. My father in law nearly broke his new crown on a pit yesterday. Whoops! I followed these instructions on how to pit cherries, but apparently I missed a few! Sorry PopPop! PS– This photo holds a hint to an upcoming giveaway that I’ll be hosting here in a few weeks. Anyone wanna take a guess at what it might be? I promise that it’s a GOOD ‘UN! Stay tuned! 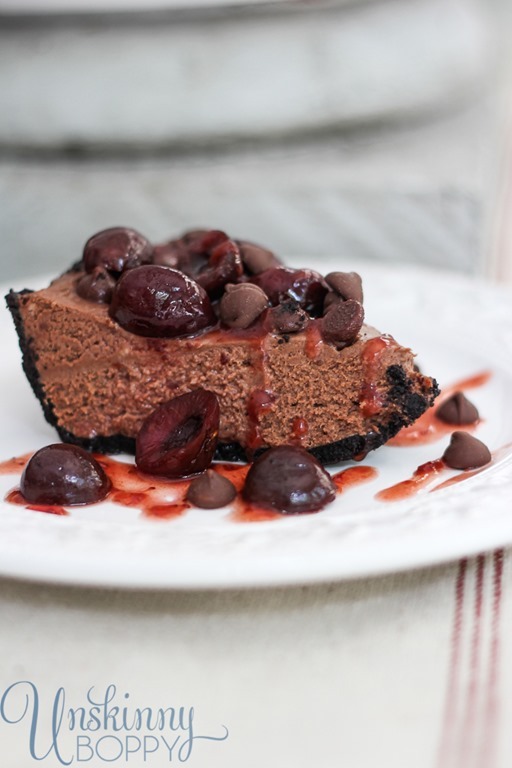 In the meantime, the oh-so-salutable patriotic chocolate cherry cheesecake recipe you’ve all been waiting for…. A melt-in-your-mouth chocolate cheesecake that strikes the perfect balance of sweetness and tartness. Sprinkle the halved and pitted cherries with sugar and place in the oven on a foil lined cookie sheet. Roast for 10 minutes, then mix together all cherries and juice with strawberry jam and cranberry juice. Set aside. Beat the softened cream cheese until smooth, set aside. In another bowl, whip the heavy cream on high speed for few minutes until stiff peaks form. Fold in the cream cheese, Nutella and melted chocolate chips until thoroughly mixed. Pour into prepackaged pie crust and sprinkle with more chocolate chips. When ready to serve, garnish with cherry topping. had to pin it, this looks delish! 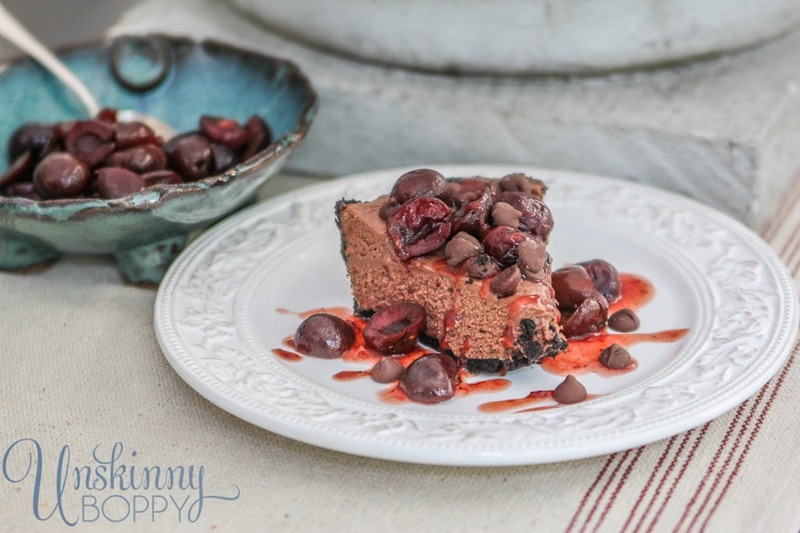 Chocolate cheesecake smothered in cherries! Oh em gee…your pictures are making me want to face plant into my IPad! Delish!! Thank you Tiffany!! I appreciate it so much! Really enjoyed your photos of Clanton — your little guy is adorable! Thanks Scribbler! Yes, let the cheesecake take priority for sure. It is delish! 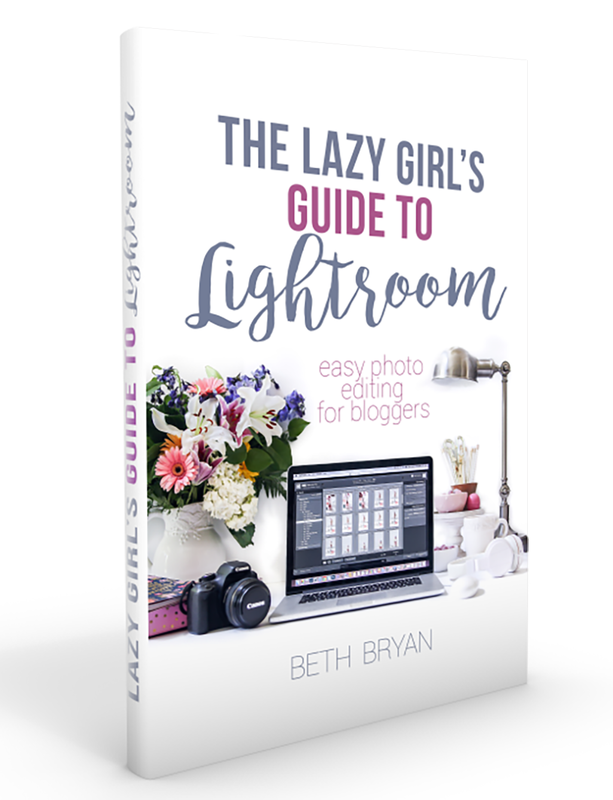 This looks AMAZING, Beth! I pinned it, and I can’t wait to try it!!! Happy 4th!